Incoming TNBC President James Curbeam speaks to members at an informational meeting in Martinez. In recent months, Teamsters 315 has been working with two groups within the IBT; the Teamsters National Black Caucus and LGBT Caucus. 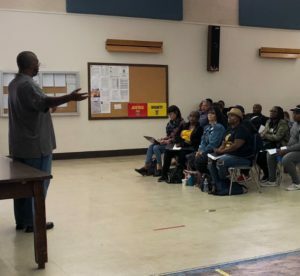 Both groups seek to educate the membership at large on the unique experience of marginalized Teamsters to promote an environment of understanding and equity, and to create pathways to resources for black and LGBT-identified members. Their mission is important to all of us because they encourage unity between all of our members and provides those with unique struggles a safe space to in which to engage. The TNBC is accomplishing its objectives by educating members on the exclusionary history of our organization and encouraging more engagement from members of color nationwide. On October 20th, we held Introduction Meeting in our Martinez Hall alongside Locals 856 and 853. There our members expressed an incredible enthusiasm to charter a NorCal Chapter of the TNBC. Doing so requires 50 members, so we are in the process of identifying those members as the charter processes unfolds into the new year. In November, members of our leadership attended the LGBT Caucus’ Strategic Planning and Development Conference in San Bernardino. 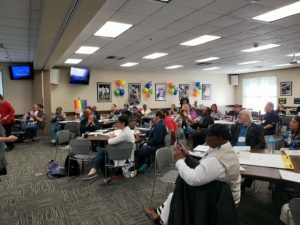 The weekend focused on establishing a vision for the future of the caucus by exploring the shared values of all members of the IBT, as well as the challenges specific to LGBT Teamsters. Vice President Donna Fernandez was inspired by the energy and engagement seen at the conference, as well as all the progress made in establishing an action plan. Moving forward, we will be working alongside Locals 853, 856, and 2010 to further promote the work of both caucuses, as well as other groups like the Women’s and Hispanic Caucuses. We hope to use the enthusiasm seen for both groups will continue to increase member participation throughout Northern California. Look out for information on the upcoming TNBC charter and events with the LGBT Caucus in January. LGBT Caucus members join together at last month’s Strategic Development Conference in San Bernardino.